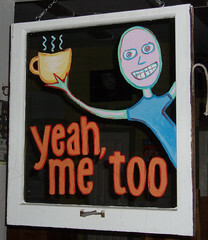 Yeah, Me Too – A Coffee Shop and that is it. Yeah Me Too is a very small coffee shop in Clintonville. If the place had a motto – it would be: just coffee – no perks and no pretense. I don’t really drink coffee but all of my friends have raved about this simple shop for over a year. YMT sells four types of coffee to take home to your coffee machine and usually has one type available to drink when you drop in. There is no place to sit, no Wi Fi, no gimmicks, no frills – just coffee. Everything is simple – hence no phone, no web site, no marketing – they just sell coffee. There may be a few baked goods from Pattycake Vegan Bakery and/or Wellness Forum Foods (Del Sroufe) in case you need a snack as you head out the door but that is more of an afterthought – maybe even a public service. One of the current coffee choices is Black Swans Blend, a mix of coffee beans from Rwanda, Guatemala, and Flores. The Black Swans are a local band with ties to past punk rockers, Gaunt (the owner was in Gaunt ). And Yeah, Me Too is a reference to the musical roots that mix into the shop. There is a great story about some of the art work on the wall and if you look into the corner by the window you will see an album about several special people from ARC Industries who created artwork for Black Swans album covers. Here is a LINK to the story. It is refreshing to see a business just do one thing and do it well. YMT is as simple as one could make it and that is just fine for all involved. It is also nice to see a business survive and maybe even thrive on Indianola – the less developed Clintonville artery. This entry was posted on January 1, 2008 at 4:40 PM	and is filed under beverages, Clintonville. You can follow any responses to this entry through the RSS 2.0 feed. You can leave a response, or trackback from your own site. Most excellent choice of coffee spots. The best coffee in Cbus. Period. I am fortunate to live a few blocks away so enjoying YMT coffee is quickly becoming a regular event for me. I just visited there today and had possibly the worst customer service experience of my life. The attendant was very unhelpful and rude. He didn’t seem to know anything about the coffee. Judging by the fact that there are so many other places to get coffee in clintonville I thought they would be excited to get business and I was excited to support someone that was local. My girlfriend and I pledged to never go back there, no matter how good or bad the coffee is. My best friend ships this stuff to L.A. for me. I can’t live without it! I moved to denver and the thing I miss the most about columbus is Yeah Me too. 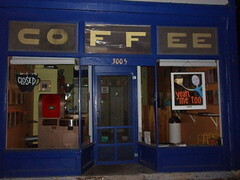 Best coffee, when I visit cbus I always bring back at least 3-4 bags of fresh roasted coffee. If it weren’t for the compostable plastic (made from corn) and the fact that they’re local, “Yeah, Me Too” would have nothing going for it. The counter dude just seems indifferent to one’s presence. CMH G reply: The lack of a customer service focus can be a bit off putting, however, on occasion, they will surprise you. The biggest concern is the lack of signage – they just assume you know what you want, how much it costs, and etc. They do make their own muffins and cookies now and provide a living for musicians so I say we keep giving them some business. You’re correct CMH G. I read the remainder of your initial entry (text under the photo). I did not know their connection to local bands & what the name implied. There are two “counter dudes” and one is just… really, really quiet. Not a bad guy at all when you get to know him, though. But regarding “nothing going for it,” I’d add that, by any standards anywhere, their coffee is very, very good. They know their beans, and they really know how to roast.